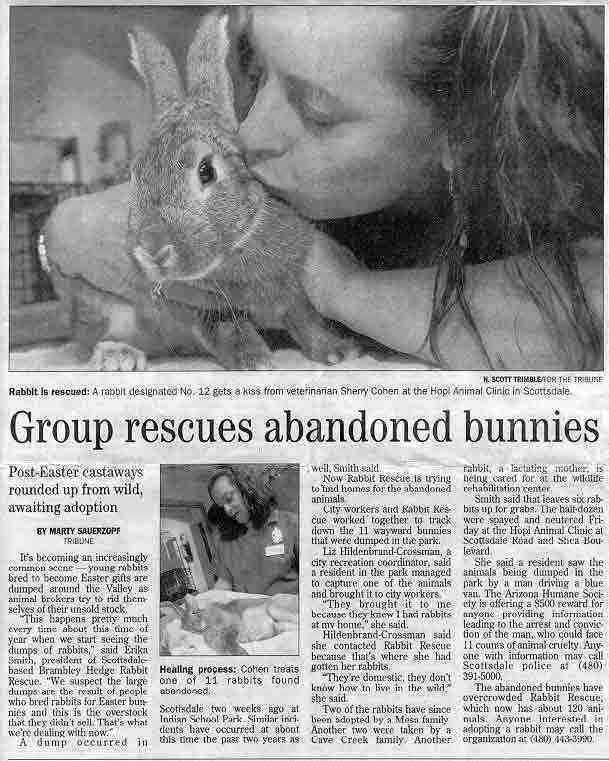 JUNE 3, 2000: It’s becoming an increasingly common scene – young rabbits bred to become Easter gifts are dumped around the Valley as animal brokers try to rid themselves of their unsold stock. A dump occurred in Scottsdale two weeks ago at Indian School Park. Similar incidents have occurred at about this time the past two years as well, Smith said. 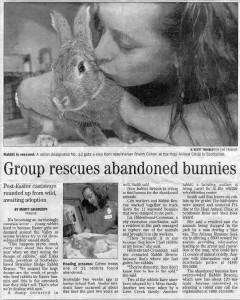 Now Rabbit Rescue is trying to find homes for the abandoned animals. City workers and Rabbit Rescue worked together to track down the 11 wayward bunnies that were dumped in the park. Liz Hildenbrund-Crossman, a city recreation coordinator, said a resident in the park managed to capture one of the animals and brought it to city workers. “They brought it to me because they knew I had rabbits at my home,” she said. Hildenbrund-Crossman said she contacted Rabbit Rescue because that’s where she had gotten her rabbits. “They’re domestic, they don’t know how to live in the wild.” she said. Two of the rabbits have since been adopted by a Mesa family. Another two were taken by a Cave Creek family. Another rabbit, a lactating mother, is being cared for at the wildlife rehabilitation center. Smith said that leaves six rabbits up for grabs. The half-dozen were spayed and neutered Friday at the Hopi Animal Clinic at Scottsdale Road and Shea Boulevard. She said a resident saw the animals being dumped in the park by a man driving a blue van. The Arizona Humane Society is offering a $500 rewarded for anyone providing information leading to the arrest and conviction of the man, who could face 11 counts of animal cruelty. Anyone with information may call Scottsdale police at (480) 391-5000. The abandoned bunnies have overcrowded Rabbit Rescue, which now has about 120 animals. Anyone interested in adopting a rabbit may call the organization at (480) 443-3990.